In Frequency Hopping, Erica Newhouse and Joseph Urla are Hedy Lamarr and George Antheil inventing military technology. The American composer George Antheil, the Bad Boy of Music, as he titled his 1945 autobiography, is best known for a jackhammer of a piece he wrote in Paris in his mid-20s, “Ballet Mécanique.” It was originally conceived as a 25-minute score to accompany a Dadaist silent film by Fernand Léger and Dudley Murphy. The music was supposed to be performed by 16 synchronized player pianos, but Antheil could never figure out how to get the pianos to play in sync. A concert version for a roster of percussion instruments including an airplane propeller was introduced in Paris in 1926. The Austrian-born actress Hedy Lamarr is best known as a voluptuous screen goddess of the late-1930s and ’40s. But in the annals of science, Antheil and Lamarr, who became friends in Hollywood in 1940, are remembered as the improbable inventors of a system for the radio control of airborne torpedoes that they called frequency-hopping. By rapidly switching a radio transmission among a large number of frequency channels the idea offered a way, they theorized, to direct missiles that could resist jamming attempts by the Nazis. They actually received a patent in 1942, though there was no interest among the American military until the 1960s. The story of these unlikely scientific collaborators is told in an imaginative, two-character multimedia 80-minute play, “Frequency Hopping,” written and directed by Elyse Singer and presented by Hourglass Group. It opened this weekend at 3LD Art & Technology Center in Lower Manhattan. As a special kickoff for a three-week run, the performance on Saturday night was followed by a 70-minute concert titled “Antheil’s Legacy,” conceived by the composer and producer Charles Amirkhanian. Ms. Singer certainly did her homework in writing “Frequency Hopping,” taking in not just the biographies of Antheil and Lamarr but also the scientific issues that dominated their conversations. As portrayed by the engaging actor Joseph Urla, the New Jersey-born Antheil comes across as a decent yet somewhat melancholic man with a wide range of interests. A mischief-making composer in Paris in the 1920s, he mingled with Stravinsky, Joyce and Hemingway. We meet him after he has settled down with his wife and son, whom he supports by writing forgettable scores for Hollywood films and teaching music. But other interests keep him fired up, especially the columns he has been writing for the lovelorn based on knowledge of endocrinology. We are products of our glands, Antheil believed. Lamarr, vividly portrayed by Erica Newhouse, is cool, sultry and keenly intelligent, a woman who does not take MGM’s overheated promotion of herself that seriously. When we meet her, she is separated from her second (of what would be six) husbands. She has met Antheil at a party and has invited him to her house, ostensibly to talk about the potential of hormones to increase the size of her breasts. Antheil’s wife and son are away. But soon the talk turns to Lamarr’s scientific ideas. She recalls the early days of her first marriage, in 1933, when her partly Jewish husband, who operated a German armaments firm, took her to dinners with Nazi officials where the conversation often centered on the search for technology to guide those torpedoes. The play captures the fanciful way Lamarr and Antheil fashioned their invention, staging mock battles with toy airplanes and ashtrays as they conceptualized the theory.Antheil brought to the table what he knew about synchronizing machines. Though romantic sparks are kindled between them, the implication is that nothing untoward happened. This is a friendship of surprisingly lonely people drawn to each other through intellectual, artistic and patriotic interests. 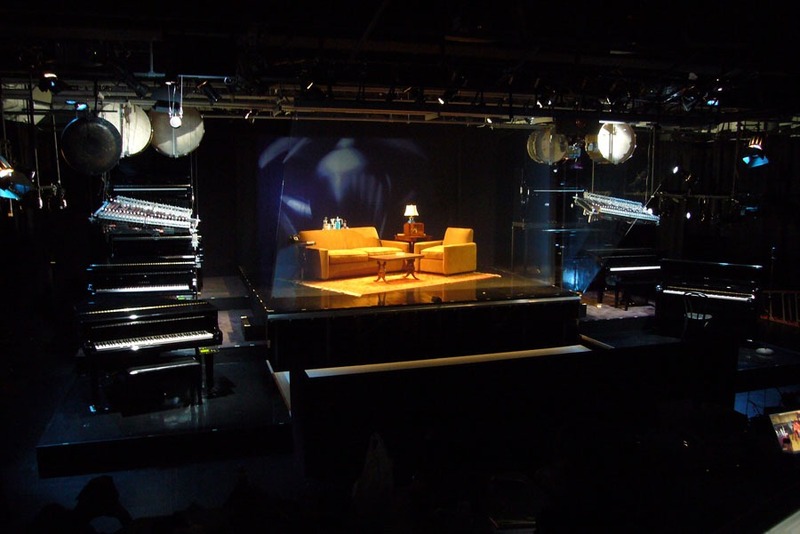 The production inventively uses video screens behind and in front of the actors that turn transparent when not in use. Fleeting projected images depict everything from scientific jargon to other people, when the play evokes, say, a chatty cocktail party. Part of the video on the front screen malfunctioned on Saturday, but the glitch did not completely spoil the effect. The voice of a radio announcer (Bruce Kronenberg) injects commentary. As an evolving conversation between fascinating friends, the play involves you. Still, it lacks a strong dramatic arc. Popular songs sung by the characters and a soft-shoe dance routine seem like filler. In the concert, “Ballet Mécanique” was preceded by performances of recent works by Luke Thomas Taylor, Harris Wulfson and Lukas Ligeti that explore various uses of digital music-making. For the “Ballet Mécanique” performance, modern technology has made possible the precise coordination of player pianos that Antheil conceived, but never realized. Antheil’s hard-driving and obsessive music picks up the barbaric rhythms and crunching dissonance of Stravinsky’s “Rite of Spring” and carries things to extremes. Still, the mood is lightened with jazzy riffs, echoes of ragtime and evocations of the industrial age, complete with a siren. To hear all this realized with such breezy accuracy by the self-playing pianos (four on each side of the stage, some of them suspended from above) and the other robotic instruments was a musical and visual treat.The film presents free-association montages of moving images: machines, whirligigs, twirling eggbeaters, a looped sequence showing a stout peasant woman lugging a sack of flour up a stone stairway, and more. It’s hard to detect how the relentlessly rhythmic music was specifically derived, as Antheil maintained, from the scenario and images of the film, which keeps shifting in pace and energy. But it hardly mattered. The combined craziness elicited an ecstatic ovation from the audience who packed the place, eager for this rare opportunity. The play runs through June 29 (with “Ballet Mécanique” on June 22) at 3LD Art & Technology Center, 80 Greenwich Street (at Rector Street), Lower Manhattan, (212) 352-3101, frequencyhopping.net. ©2008 The New York Times Co.